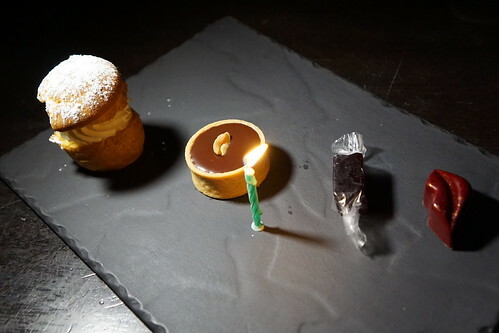 I spent my birthday weekend last December eating and drinking my way through Las Vegas with some friends from LA. We had some pretty stellar food throughout the weekend, including a meat-centric birthday blowout at Jose Andres' Bazaar Meat! One of the hardest decisions you'll have to make during a dinner at Bazaar Meat is which cow you want your steak that night to come from. 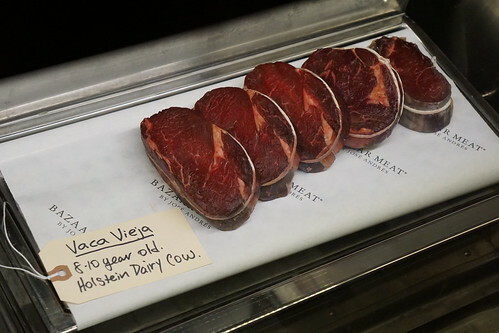 One of the most special meats they have is the Vaca Vieja, which means "old cow". This is 8-10 year old Holstein dairy cow (cattle for beef is typically slaughtered starting from 18 months and dairy cows from 4 years), and vaca vieja is typical meat found in Basque Country. Because of the age, there's actually more flavors to the vaca vieja meat, but the server warned that it could be an acquired taste. 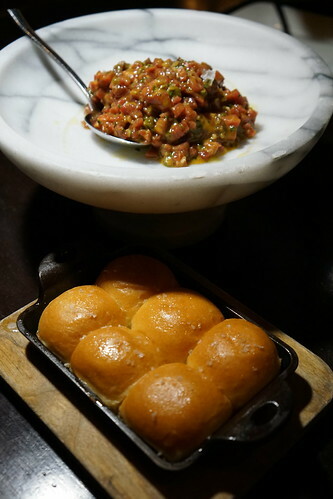 Since we wanted to try as many things as possible, and the steak tartare is made with vaca vieja, we decided to try that particular meat as a tartare, and try a different one for our steak! See the dark color of the vaca vieja? It's very distinct from other beef at the restaurant. 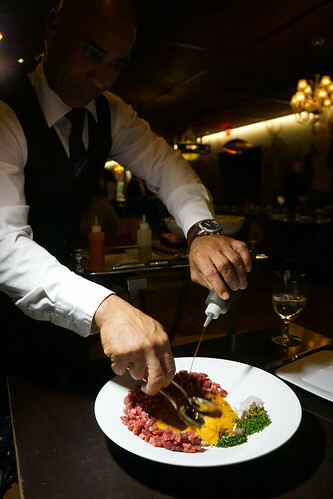 The tartare was a sirloin cut, prepared tableside with Savora mustard, egg yolk, HP sauce, and anchovy. It was then served in a marble bowl with some Parker House rolls. 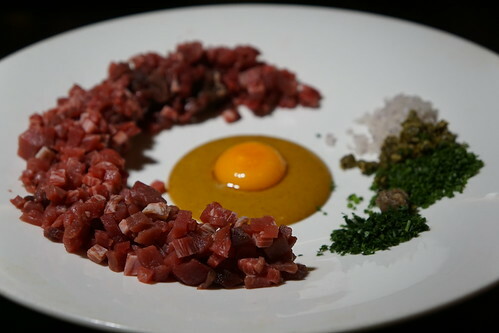 Because the meat comes from an older cow, it really has a lot of flavor, but it was also not as tender if you're used to Angus beef, but this texture actually works wonderfully for a tartare. One of the best I've ever tasted. 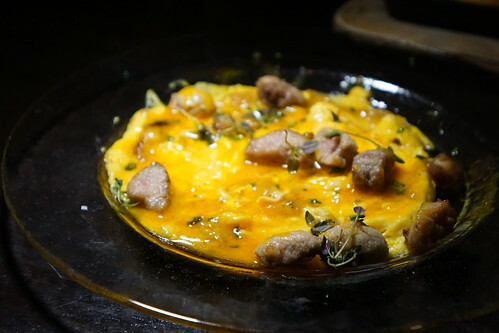 Tortilla Sacramonte, which was described as "egg omelet from the heart of the Gypsy neighborhood of Sacramonte, Granada Spain" ($22). After eating this, I definitely want to visit Sacramonte. 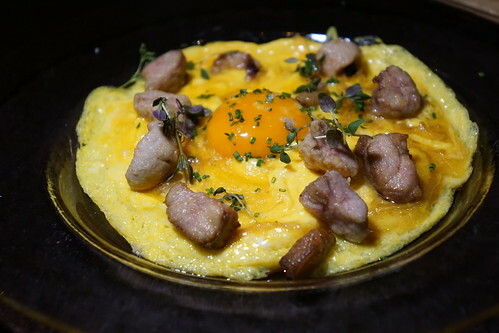 The omelet was served with kidney, sweetbreads, and bone marrow - again, mixed tableside. It puts all other omelets to shame. Those sweetbreads! Then, the main attraction: 2.5 lbs bone-in ribeye steak with cattle from Rosewood, TX with a rosemary mustard sauce. Our server had recommended the Rosewood, and I must agree with this suggestion! The Rosewood beef comes from cattle bred to be at least 50% wagyu in North Texas (raised naturally and sustainably, of course). 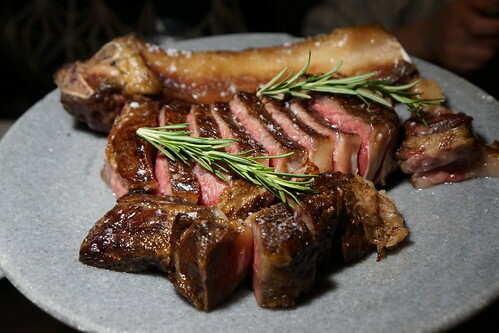 100% wagyu (like the one at CUT) is usually too fatty for me to enjoy a big ol' steak with, so the Rosewood was actually perfect. It was still quite fatty but it still had the meatiness I look for in my steak, both in flavor and texture. For our "dessert", we got the foieffle. I first had the foieffle in 2014 at Barmini in Washington, DC and these were just as good as I remembered. 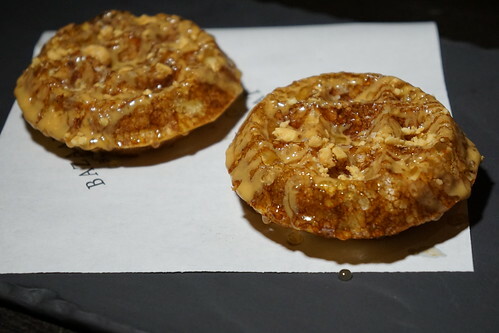 Air waffles filled with foie espuma, peanut butter, and honey ($12 each). 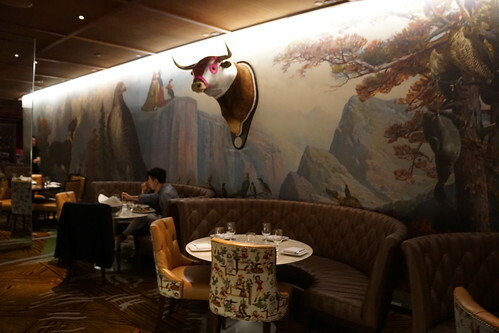 Bazaar Meat is unarguably one of the best steakhouses in the country, as is evident in their in both selecting the meat source and the preparation. It was the perfect place for a birthday dinner, coupled with an opulent yet whimsical dining room designed by Philippe Starck. There were still a lot of dishes (and beef!) that I want to try - next birthday, perhaps? Baby carrots? 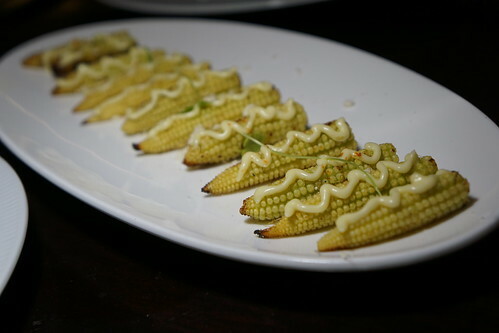 Looks like some wonderful tiny corn to me! What a great meal, the aged tartare sounds fantastic!